Enchanted Art World consists of two parts: a physical installation and a virtual reality world. 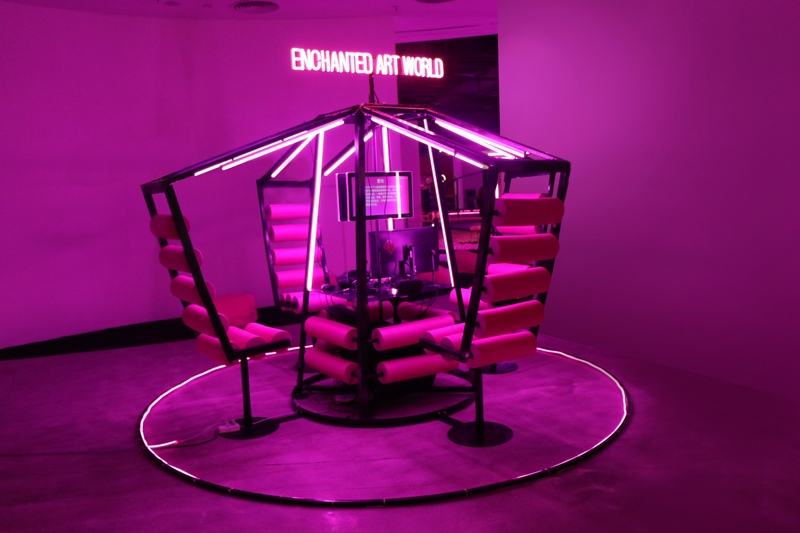 The physical component is chiefly comprised of a four-seat installation, which allows 2~4 people to sit and enter into the “Enchanted Art World” though wearable VR headsets. The VR world is separated into two halves, the first of which is the art world under a literal spotlight. This represents the core of the art world, consisting of curators, collectors, art critics, fashion designers, and well known artists, etc. The other half portrays the art world left in the shadows, including out-of system artists. This artwork creates a “lucid dream” for audience members to experience the art world through Wang Xin’s imagination. The experience asks participants to reflect and rethink the dynamic system of the art world itself.